Ha, the satisfaction of the finished project! But really finished, meaning the only thing left is to step back and enjoy. Unfortunately this does not happen often. That’s why I am delighted to show you my first cross stitch project, all done and framed. This project will be remembered as the Summer 13 project as I started mid June and just finished it a couple of days ago. I didn’t have a clue how long it would take and I now know that cross-stitching is a slow but rewarding process. I also added some perfectionism in the mix for good measure: after the stitching was done, I started fixing one little flaw and an other, because why getting in the trouble of fixing one if there is a few more to fix, and next thing I knew I added several hours to the overall project. Cross stitching is so soothing. The moves are quite easy and repetitive, it gets you in a rhythm which makes the whole thing difficult to put down. I love how it allows to play with colours too. The final result is very rewarding. I used some natural linen and a 2×2 grid because using only one single square would have made the stitches too small. The design is a mix between some free pattern found I don’t remember where online (if somebody knows where it comes from, please let me know so I can credit accordingly) and an italic alphabet found on this page. The embroidery hoop works just fine to frame it. I was considering decorating the frame in some way but finally left it as is. I am now hoping to make a lot of other ones because this one will feel a bit lonely above the mantel piece, where I plan to hang it. Lovely blog. Added to my blog roll. Thanks Martha for stopping by and for the lovely comment. 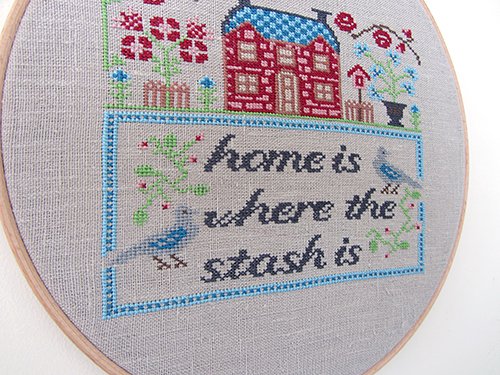 Do you find cross stitch addictive too? Oh yes! I love cross stitching – very therapeutic, calming, it gives you time to sit down and have a think about something or you can just entertain yourself while watching telly. 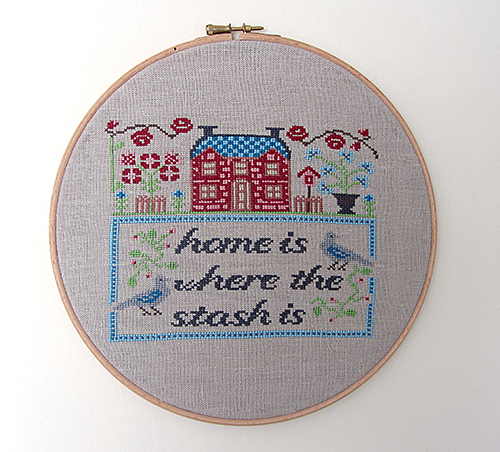 I’ve been cross stitching for a while now, with on and off projects (large part of them being Scandinavian too! ;)) as I try to do other hobbies as well – cards, glass painting, still working on improving my knitting and want to brush up my crochet skills too! Plenty to do!